Tired of waiting in long queues to book your favorite movie ticket? BookMyshow is at your rescue. BookMyShow lets you book your favorite movie at your favorite theatre at your convenient time. What makes Book My Show different from others is that for select theatres you can also order your favorite food so that you don't need to walk out during the interval. With BookmyShow not just movies but all the events that is happening in town can be booked here. Everything at just a click of a button. BookMyshow has redefined the experience of movie watching. Take your gadgets out and see your favorite star in action! Hurry up! Book Now! Apply code on your checkout page and make avail of this offer now! Verified on 20/4/2019 . Get Pantham movie tickets now available online at bookmysho.com. BookMyShow offering buy one get one offer on Pantham movie tickets booking. Use SBI, ICICI, HDFC, AXIS, RBL, YES Bank, HSBC, Kotak, IndusInd Bank, IDBI Debit & Credit Cards for getting Buy 1 Get 1 Free. Hurry! Grab your all latest movie tickets now. Verified on 20/4/2019 . Order movie snacks on BookMyShow website or to get Rs 75 discount on transaction value whichever is lower on BookMyShow website or app. Customers have to book movie tickets and movie snacks in the same transaction to avail the discount. Select the movie, cinema, and show of your choice, and go to the order page of movie snacks and your favourite combos. You can also book from various theatres like Cinepolis, PVR Cinemas, IMax, Cineplex, Asian Cinemas, Gpr, Cine planet and lot more. This offer is valid for both old and new users in various cities like Chennai, Bangalore, Hyderabad, Delhi, Mumbai, Velachery and more. Verified on 20/4/2019 .!! Bookmyshow PayPal Offer - Sign up and pay with PayPal account and get Rs 125 worth gift voucher. Offer is valid on a minimum transaction of Rs 400. Hurry! Sign Up now and get the gift voucher. Check out more details on the landing page. Enjoy The Show! Book move ticket at BookMyShow today and take away 25% cashback on making payment with PayZapp wallet. Offer is valid once per user during the offer period. Offer is only applicable on Mobile App. Use the given Bookmyshow offers code in order to avail the discount. Book with PayPal and get flat Rs 150 discount on bookmyshow booking. Minimum order value should be Rs 300 required to avail this offer. This is valid only once per user during the offer period. Just go through the regular ticketing flow for selecting the movie, cinema and show of your choice. You will need to transact for a minimum value of Rs 300 to be eligible for the offer without any discount code. Verified on 20/4/2019 . Exclusive offer for HSBC users! Buy one movie ticket online at BookMyShow and get another ticket absolutely free on all your online bookings. This offer is applicable for both old and new users, and valid on all the bookings made through BookMyShow mobile app. Make your payments using HSBC credit card, debit card or internet banking. Before it goes expires get all movie deals today. Hurry Up! Verified on 20/4/2019 . Get flat Rs 100 discount with Federal Bank debit cards on movie ticket booking via Bookmyshow. Offer valid on minimum transaction of Rs 300. Offer valid once per user during the offer period. Follow the landing page for more details.No bookmyshow coupons are not required to get this offer. Verified on 20/4/2019 . Union bank credit and debit card offer. Get 20% discount upto Rs 100 on online movie tickets and Rs 50 off on food and beverage combos with Union bank debit and credit cards. Valid on all shows from 3:00 PM on Saturday and Sunday. Offer is valid thrice per card during the offer duration. Book it now. No promo code is required to get this bookmyshow bank offer. Verified on 20/4/2019 . Movie and a bucket of popcorn is a perfect combination. So many people enjoy munching popcorn while they watch movie. But these days, buying popcorn at theaters have become expensive and all thanks to GST. Don’t worry about the pricing now as BookMyShow is offering discount on movie snacks. All you need to do is order movie snacks on BookMyShow website or app and get Flat 25% off on the order. Applicable at select cinemas only. Hurry! Book movie tickets and get 25% discount on snacks. Use promo code and get this offer. Verified on 20/4/2019 . Get flat Rs 100 cashback using Jio Money on BookMyShow. Offer is valid on a minimum transaction value of Rs 100. Offer is valid for transactions done on Friday, Saturday and Sunday during the offer period. Each customer can avail the cashback only once during the offer period. The cashback will be credited in your JioMoney wallet within 4 working days from date of transaction. Use this amazing coupon code to watch movie at lesser price. Valid for new and old users. Book your movie tickets now. Verified on 20/4/2019 .. Get flat Rs 100 off on movies and Rs 50 off on FnB using your RuPay Platinum Debit or Credit Card for the first time on BookMyShow. Offer can be availed on Friday, Saturday and Sunday for shows only on Friday, Saturday and Sunday. Minimum booking amount to be more than Rs 100. Both the discounts will have to be availed in a single transaction. Both the discounts can be availed on one card only once during the offer duration. Verified on 20/4/2019 . Flat 25% discount on Inox large popcorn and coke combos exclusively on BookMyShow website and app. Select the movie, Inox Cinema, and show of your choice. When you reach the Booking summary page and add your discounted Inox Large popcorn and coke combo to avail the discount. Book My Show offer code is not required to get this offer. Inox combos are very delicious and customer satisfactory. Book your tickets now and get discount on food. Verified on 20/4/2019 .. BookMyShow presents buy one and get one free tickets for all the Citibank Debit Card users. This is applicable only on Citi Priority, Citigold & Citigold Private Client World Debit Card. Please go through terms and conditions at the lading page and avail this attractive offer. Minimum of two tickets have to be booked per transaction to avail the Citibank movie ticket offer. No Book my show code is required. Book now. Verified on 20/4/2019 .. Book 2 or more movie tickets at BookMyShow and get up to Rs 125 discount, or 50% off on the total transaction value, whichever is lower. A minimum of 2 movie tickets needs to be purchased online in order to avail the discount. The offer can be availed once per user during the offer period. This offer is applicable for both old and new users online. You can also book from various cities like Hyderabad, Bangalore, Mumbai, Kolkata, Chennai, Delhi and lot more cities. Hurry up! Book your tickets today. Verified on 20/4/2019 .. BookMyShow and Payzapp wallet together are offering an exciting deal just for you. Book your movie tickets online through Payzapp wallet payment and get 50% discount on ticket price max up to Rs 100 cashback. Use MOV50 offer code and get cashback. This offer is valid only on a mobile app and. This offer can be availed one time. Click here to get it now. Book it today. Hurry! Verified on 20/4/2019 .. Avail flat Rs 150 discount on all your online movie ticket bookings. Coupon code is STEALDEAL. This coupon is applicable on all the movies and valid for both old and new users. You can also watch the official movie trailer online, you can book from various cities like Bengaluru, Chennai, Delhi/NCR, Hyderabad, Kolkata, Mumbai, Pune, Gurgaon, Ahmedabad and lot more cities but limited to selected citites only. You can also book from various show timings like 11:30 AM, 02:30 PM, 06:30 PM, 09:30 PM and many more shows. Hurry up! Book today. Verified on 20/4/2019 . Get flat Rs 100 cashback using Jio Money wallet on BookMyShow. Offer is valid on a minimum transaction value of Rs 100. Offer is valid for transactions done on Friday, Saturday and Sunday during the offer period. Each customer can avail the cashback only once during the offer period. The cashback will be credited in your Jio Money wallet within 4 working days from date of transaction. No movie offer code required. Book now. Verified on 20/4/2019 .! Now book your online movie tickets at BookMyShow and make your payments through RBL bank credit or debit cards and get up to Rs 100 off on all your online payments. This offer is applicable for 15 transactions per user in a month. No special coupon code is required to avail the discount. Get to the landing page to avail this wonderful offer! Verified on 20/4/2019 .. Now you can earn and redeem payback points every time you book your favorite movie tickets on the BookMyShow website and mobile app. Use your payback card number or registered mobile number, to earn payback points. You can also check your payback points balance, by just sending SMS PBBAL to 9212146468, from your registered mobile number. With Bookmyshow, book movie tickets for any movie and get 10 reward points on every Rs 100 spent using your Simply Click SBI Credit card. This offer is valid on every BookMyShow transaction done using Simply Click SBI card. Go through the regular ticketing flow for selecting the movie, cinema and show of your choice pay using your Simply Click SBI card and for every Rs 100 spent, 10 reward points will be credited to your account. Verified on 20/4/2019 . Avail 5% cashback on movie ticket bookings online at BookMyShow. Make your payments through Axis Bank titanium rewards debit card and avail the discount and also get yearly benefit of Rs 1000. Go through the regular ticketing flow for selecting the movie and proceed to payment page. A user can get maximum cashback of Rs 1000, applicable cashback amount will be credited to your Axis Bank savings account. IDFC bank debit card offer is here at BookMyShow. Avail flat Rs 250 discount, a user can get maximum discount of upto Rs 125. All you need to do is confirm your details by providing your email id and mobile number. No minimum booking value is required to avail this offer. Verified on 20/4/2019 .. With BookMyShow, Get 30% discount on movie tickets with your Digi bank. Flat 30% discount is available on both website & mobile app bookings. Make your online payments using Digi bank debit card, credit card or net banking. You can book from various theatres like Inox in Kolkata, Cinepolis in Kukatpally, PVR Cinamas in Forum mall, Asian Cinemas in Inorbit mall, Sky walk in Chennai, Ampa theatre in Chennai and lot more. No promo code is required to avail the discount. Book now. Buy 1 ticket and get the second ticket absolutely free. This offer is applicable on IDBI Bank aspire platinum credit card, IDBI Bank imperium secure credit card & IDBI Bank euphoria travel credit card. No extra coupon code is required to avail this offer. Verified on 20/4/2019 .. Flat 50% discount on PVR snack combos exclusively on BookMyShow website and app. Select the movie, show and PVR cinema of your choice. When you reach the Booking Summary page and add your discounted PVR combos and get the discount. No BMS offer code required to grab this offer. Get it today. Hurry Up! Book tickets worth Rs.500 on BMS and get vouchers worth Rs.500 on paying via MobiKwik. Offer valid once per user. Exclusive offer for IndusInd bank credit card users! Flat 20% discount on events and theatre bookings. You can make your payments through platinum exclusive, platinum plus, platinum premier, platinum select, signature select, signature exclusive and signature debit cards. This offer is applicable only on online bookings. Avail flat Rs 75 discount on your favourite movie tickets. This coupon code is applicable for both old and new users. A user can get maximum discount of Rs 75. This coupon code is applicable in all cities like Hyderabad, Chennai, Bangalore, Mumbai, Delhi and many more. No minimum booking value is required to avail the discount. Idea matinee movie platinum offer! Avail flat 25% cashback of upto Rs 100 cashback on movie ticket bookings. This offer is applicable on the payments done through Idea Money payment option. Click here and check the details at the landing page. Verified on 20/4/2019 . Exclusive offer for DBS bank customers online at BookMyShow. Get upto Rs 500 discount on online movie tickets booking, concerts and play tickets booked with your DBS bank treasures card. This offer is applicable for both old and new users online. No minimum booking value is required to avail the discount. Get 25% discount on movies with YES first exclusive and YES first preferred credit cards. A user can get maximum discount of Rs 250 in a month. Go through the regular ticketing flow for selecting the movie, cinema and show of your choice. You can book from various theatres like Big Cinemas, Cinepolis, PVR Inorbit, Inox GVK one, PVR Panjagutta, PVR Kukatpally, Asian Radhika Multiplex in ECIL and lot more. No minimum booking value is required to avail the discount. Check more details in the landing page. Hurry up! Book today. Movie buffs don’t want to miss out on latest flicks that they like! If you happen to be one then it’s completely expected of you to keep an eye on the latest releases online. This is because today the online world opens its doors for you to browse and select from some of the best discounts on online movie ticket booking and save more. Whether you are watching the movie all by yourself or have a friend along, there’s always a coupon online that you can make use of and save more. If you love watching movies and also browsing online, then Bookmyshow is the best app for you! Here you can keep a tab of all the movie releases as well as the show timings in multiple screens and make your selection accordingly. Other than being able to use the Bookmyshow ticket offers for movie tickets, you also have the chance to save more on the foods and beverages too that are available at multiplexes. There are attractive combo deals that you can browse through and make the most of. If you want to stay updated about other events and plays that are taking place in your city, this app helps you check out the same as well. So from a cake making, bridal make-up workshop to the latest play by Joy Sengupta and other artists, you can have access to all. Furthermore, people who love sports can also opt in for sport events and participate in the same getting all the details from Bookmyshow app. If you have been searching for a platform from where you will have the chance to book the best of the Bookmyshow tickets and save, then it’s HappySale. And here you will come across several offers to opt in for. Such as the bank offers on debit and credit cards from prominent banks such as ICICI, HDFC, SBI, Axis, Standard Chartered, Citibank and many more. In addition to there are amazing discounts on the famous online wallets such as Paytm, Mobikwik, Freecharge, Jiomoney, OlaMoney, Oxigen and other leading ones. Wondering if it’s an ordeal to be able to browse through HappySale, select the best offer for you and have the same activated. Then the answer is its simple! So all you have to do is browse through HappySale and then check out the multiple Bookmyshow coupons and offers on the latest Hindi and English as well as regional movies that are already listed. Read through the offer details well so that you can make the best selection. Once you have done that all you need to do is opt in for the “show code” option for the deal you’ve selected and use it when you make the payment. This way you will get your discount code. Have you watched the latest Bollywood movies such as Padmavat and Padman? If not, then you can opt in for the offers that are available on Boomyshow on all the latest movies in Hindi and other regional languages and have the chance to save more. English movie buffs can watch super hits like The Post, The 15:17 Paris, Phantom Thread, Hostiles and The Shape of Water and make the most of the cashback offers and bookmyshow 150 off code. Furthermore, you can also check for the upcoming releases and the offers that are available on the same. Most movie buffs often get their time during the weekends to watch their favourite movies! For this you can always make the most of the Bookmyshow weekend discounts and offers that is listed. Here you get to make the most of offers such as Weekend evenings within Union bank card offers where you get your movie ticket at Rs.175 along with some food combos to go with. In addition to this, there are many other offers and discounts as well that you can opt in for. So get your Bookmyshow weekday offers today! When you browse through HappySale you will come across plenty of deals and offers! However, the best deal is the one that for you seems perfect. This means a movie ticket offer that is available for the movie you opted in for, the time that you opted in for as well as price after the discount code, comes within your budget. Sometimes, you will get the best of cashback and buy 1 get 1 free movie ticket offers in Bookmyshow that enables you to save instantly. Festive times are the best time where you can watch your best movies with your friends, family and near ones. So here at Bookmyshow you will have the chance to opt in for the best Diwali, New Year, Dusherra, Christmas and other festive offers and save more. If you browse through the Bookmyshow app then you will have the chance to browse through a section named as “Experiences”. This section mention events based on various categories that will enable you to experience multiple talk shows, stand-up comedy shows, open mics, city tours, joy rides, cultural events, musical shows, DJ nights and the like. You can check out the events based on your city and can opt in for the same. There are many workshops and handicraft fairs and other interesting festivals too that are gets listed in this section on demand. 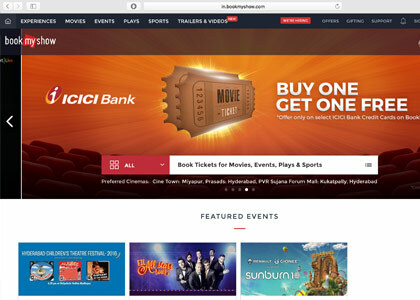 When you are booking your movie tickets or event passes from Bookmyshow making use of the multiple coupons and discount codes that are on offer, you will experience fast and hassle free online payment transactions. The payment channels are smooth and secured and you can check out from your booking within few minutes. Keeping in mind its superb service, today Bookmyshow is counted as one of the popular online movie ticket booking app that people across all age group is fond off. However, there could be few online customers wondering the reasons that make this app a preferred one amidst everyone. One of the reasons is this, that the app offers correct data about the movie in terms of the date its releasing, the movie star cast, the movie halls where it’s releasing which includes the single screens as well as the multiplexes, the movie timings of almost four days in advance, the price of the movie tickets and many more. For those who would want to know a bit about the movie prior to watching it, there’s a short synopsis of the plot offered. Furthermore, to add to that, movie lovers can also have a look at the latest movie reviews posted by various viewers and decide if the plot sounds interesting to them to watch the movie. If are a new user you can make the most of the bookmyshow first user offers and save more. This popular online movie ticket booking app enables you to save in many ways! There are the Bookmyshow gift cards and Bookmyshow gift voucher code that you can gift to your friends or near ones who are movie lovers. The gift cards are designed keeping in mind the movie lovers preferences and hence is a great gifting option. If there’s any need there’s the Bookmyshow customer support centre that can be contacted and the help will be prompt. In addition to that, the brand has also introduced its superstar program that is aimed to reward those customers who frequently book their online movie tickets from Bookmyshow. Presently, this is an invite only feature. If you are an avid movie buff who is searching for the best deals in Bookmyshow offer code today and the authentic one too, then HappySale is the place to be. This website searches the internet and lists down only the best deals that come with deal descriptions. So you have the chance to read more on that, to get clarity and have the deal activated prior to the expiry date of the offer!